Around 1957 Jim Skonzakes starts to experiment with with special Pearl Paste used in the jewelry Industry. He managed to use it as a finish for the Golden Sahara 2 which initiate the popularity of the Pearl Automotive Finish. 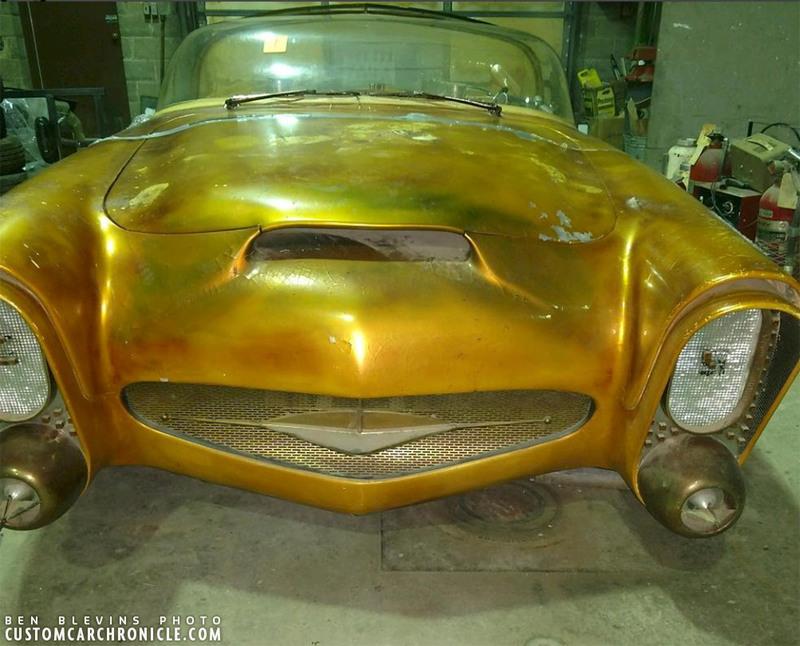 We will be highlighting the Golden Sahara I and II details in a series of articles here on the Custom Car Chronicle as a tribute to Jim Street (Skonzakes) who passed away in early December, 2017. In this article we will highlight the totally unique and spectacular Pearl Paint that was used on the Golden Sahara II. 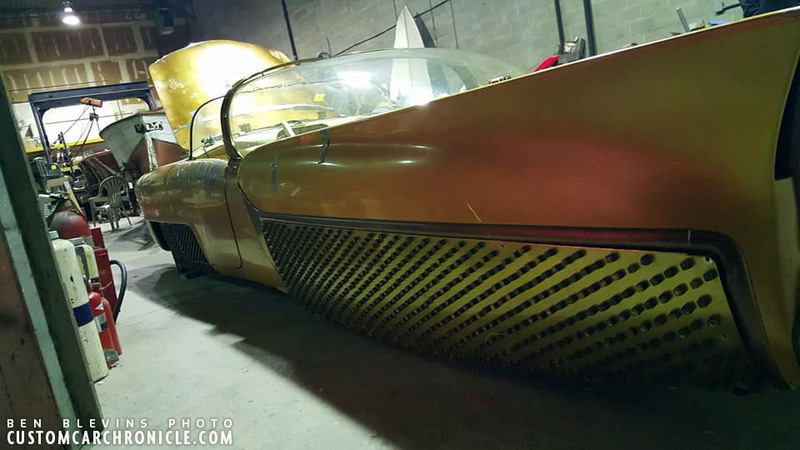 After having toured the Golden Sahara I around the US for a few years it was time for Jim Skonzakes to take the car apart and start all over. In the past few years Jim had dreamed up a lot of new ideas to make the already stunning Golden Sahara even more spectacular. 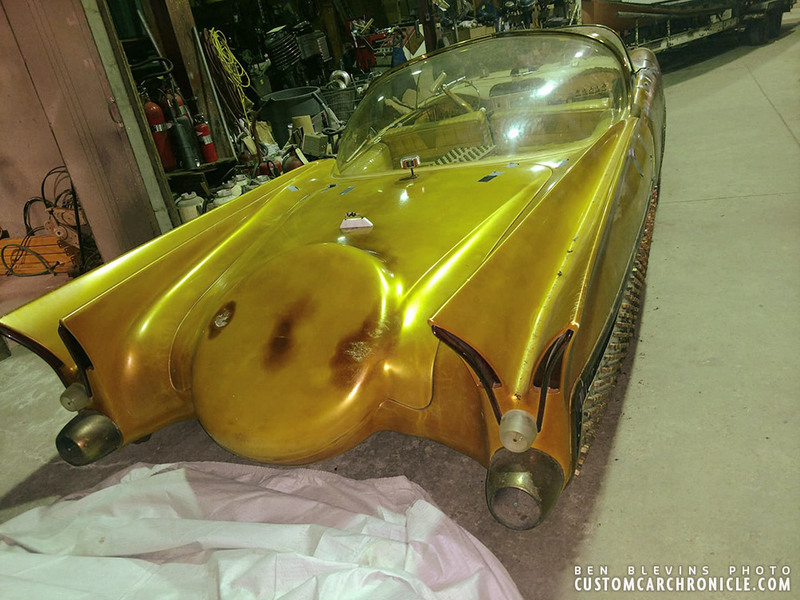 When Jim’s friend designed the Golden Sahara around 1954 everything was state of the art, especially the design features of the car, a wonderful mix between traditional Customizing, and Factory Show Car. Even though the Golden Sahara I was spectacular, Jim felt that his Dream Custom could be much more in many aspects. From a Barris Golden Sahara Press Release in the early 1960’s. 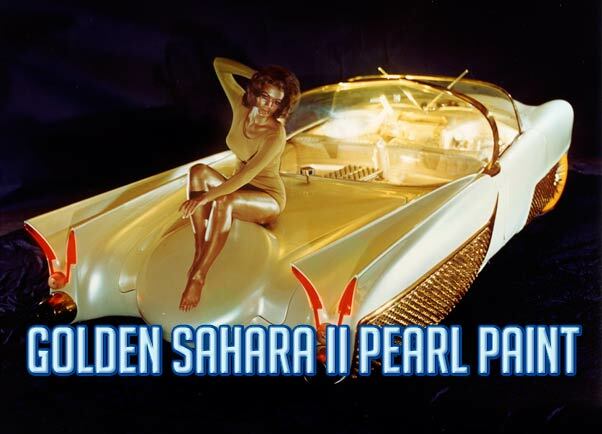 From the beginning the pearl paint on the Golden Sahara has been the subject for many wild stories. Some of the stories mentioned that the car was painted using a special paint mix created from fish scales bought at the local Market. The fish scale part is actually true, but they were not sourced from a local Los Angeles market as claimed. We get back to that later. Lets first tell the story where the idea of the pearl paint came from. Jim Street told me the story that would led to the Golden Sahara II paint during my interviews with him for the Jack Stewart Ford book in 2012. 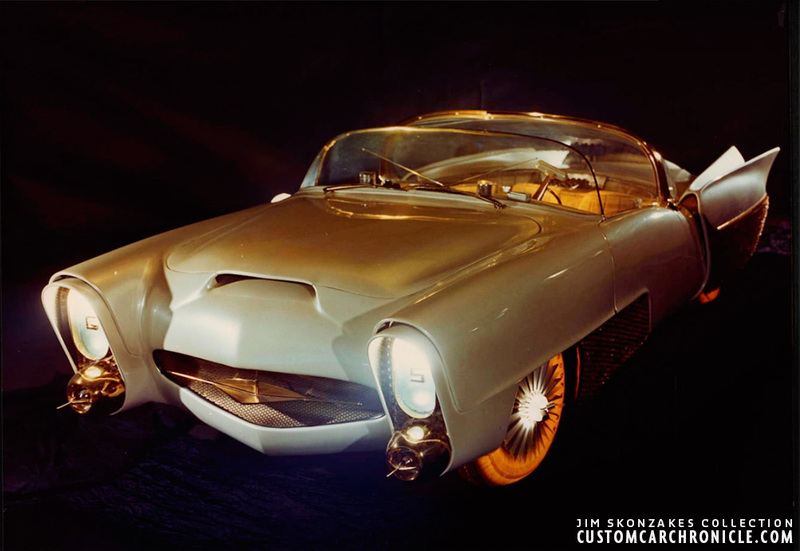 During the time (around 1957) Jim was working on creating the GSII he often wondered about a new color for his car. 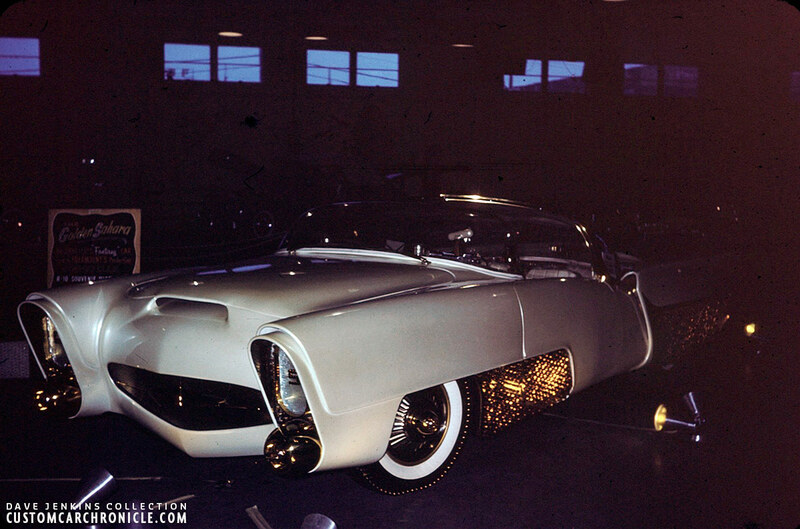 The first version of the Golden Sahara was painted refrigerator white, and while Jim loved the color, he felt that the new much more sophisticated version of the Golden Sahara needed a more spectacular paint finish. He had looked at many metallic paints, but none of them were considered suitable for what he had in mind. One day while eating lunch at a local restaurant, Jim noticed that the waitress that was serving his food was wearing a pearl necklace. The pearls looked amazing, sparkly and pearly, with this amazing warm shine. He asked the waitress about the pearls, and secretly hoped they were not the real deal, but something that was manufactured. They were fake pearls the waitress said, she had bought them at the Ten-Cent store, and they were actually very cheap. She took of the necklace so Jim could have a closer look. Jim thought the pearl finish looked absolutely stunning, and would suite beautiful as paint for his Golden Sahara. A similar cheap fake pearl necklace as Jim Skonzakes was inspired by to paint his Golden Sahara II in pearl white. All hyped about the new idea he went down-town Dayton Ohio, where he lived, and found the pearl necklace at the Ten-Cent store, just as the waitress had mentioned. He bought the necklace and went home to study the information on the box. The manufacture company address was listed on the back of the box, and he got in touch with them. Jim soon found out the pearls were made from plastic which were coated in a special pearl paint. After Jim had made sure he only wanted to have the paint info to see if he could use it to paint his special Custom Car, the necklace company was even so kind to provided Jim with the contact info of the pearl paint. 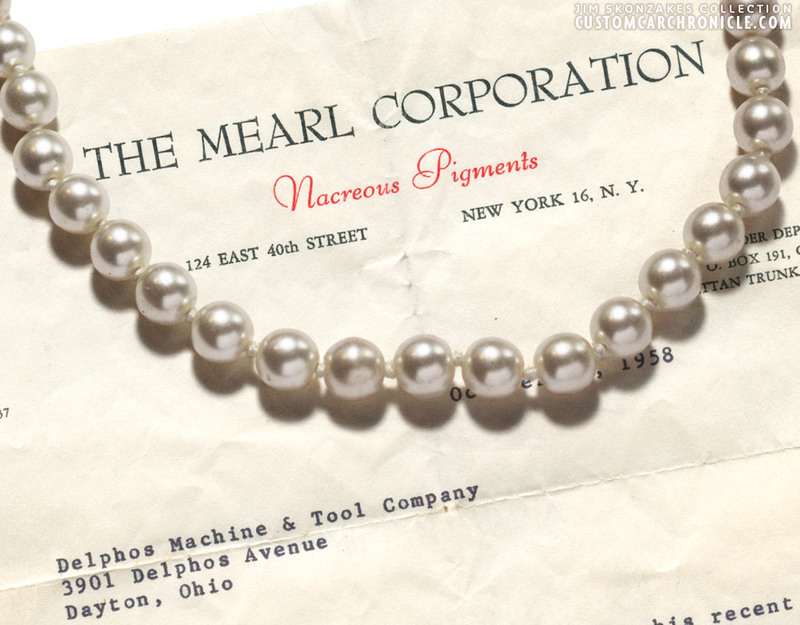 The Mearl Corporation was the one that produced the beautiful pearl paint for the necklace pearls. 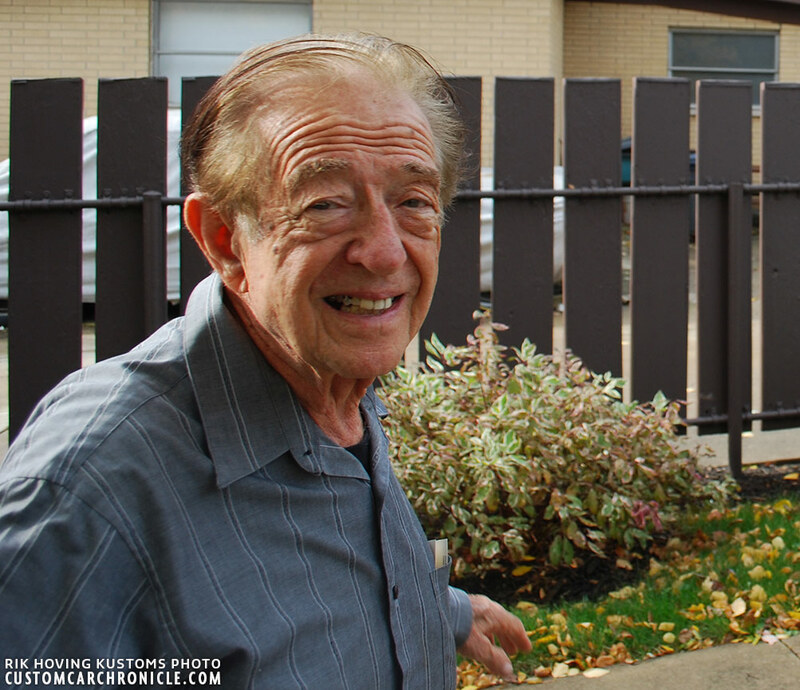 Jim talked to them on the phone, explaining that he needed the paint for his car. The people at the Mearl Corporation told Jim how they used imported fish scales from the orient, a by-product, as base for their paint. The scales were bought in bulk, washed and cleaned, then dried and carefully pulverized. The powder was then mixed with special resin to form a paste. This raw paste was the product that was sold and which could then later be mixed with clear nitro cellulose and sprayed onto the plastic pearls at the necklace company. 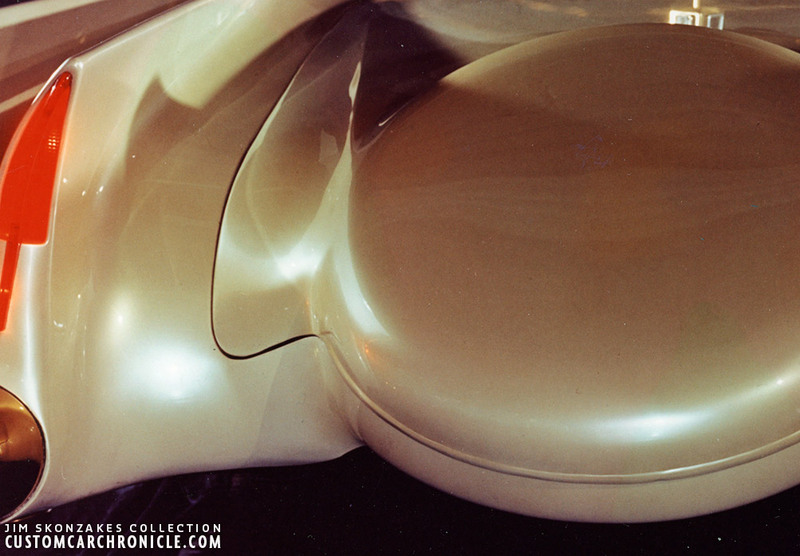 The Mearl Corporation told Jim that because of the Nitro Cellulose base, it most likely would not be suitable for use on larger area’s like a complete car. But that they were more than happy to help, and supply Jim with the raw paste and even the pulverized pearl power, so that Jim could experiment with it. And they would be very interested in the results. Part of a newspaper report on the special features on Jim Skonzakes’s Golden Sahara. 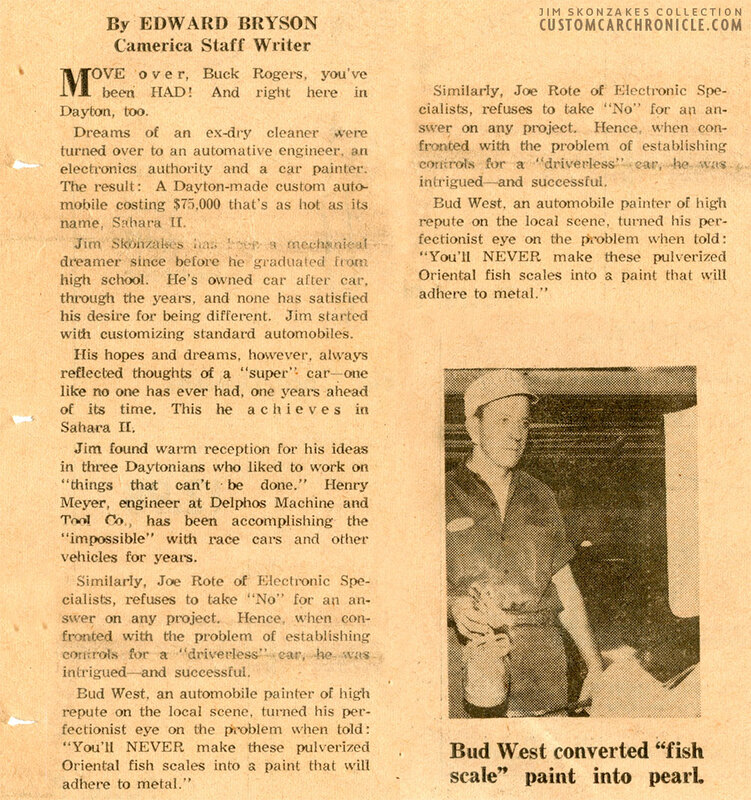 The Golden Sahara was being constructed at the Delphos Machine & Tool Shop in Dayton, Ohio, where Jim did a lot of testing with the pearl paste together with Bud West, a local Dayton Ohio paint legend. They started with clear and mixed in the pearl paste, one table spoon first then mix it completely and very carefully, then add more pearl paste as well as pearl powder, and keep mixing and experimenting until the effect was just right. They finally succeeded in creating a paint that could be sprayed on larger areas, like a car, and it looked absolutely amazing. 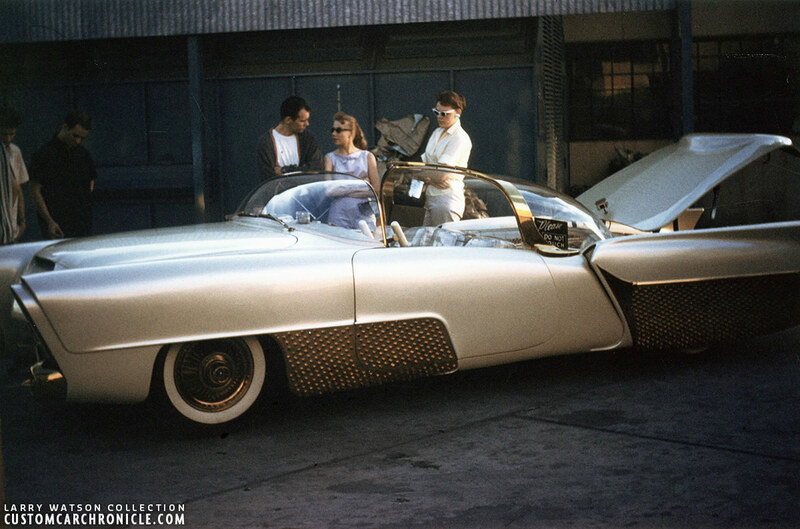 When the Golden Sahara was ready for paint, the car was first made as straight as possible. Many guide coats where needed to get the body as straight as needed. 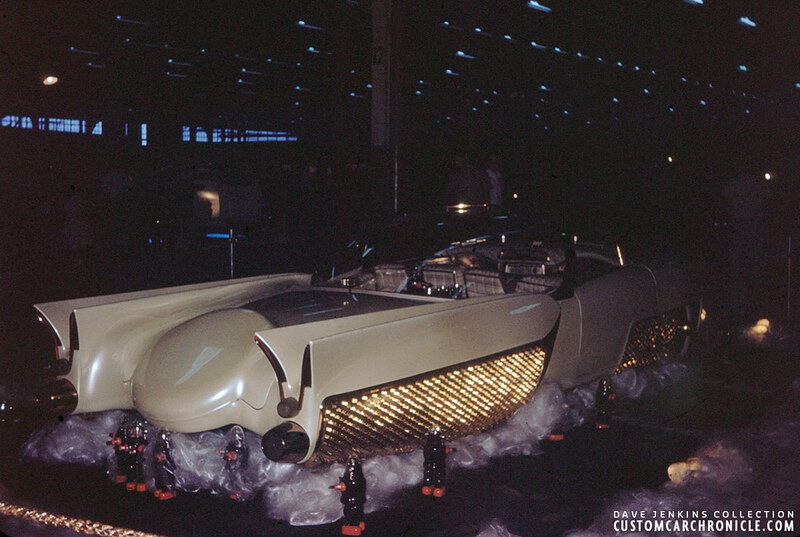 Then the car was painted refrigerator white and then it was covered with many coats of the translucent special pearl mixture. The end result was absolutely stunning, and just as breathtaking as Jim had visualized it. He knew he had made the right choice, and the paint was accenting all the body modifications, and enhancing all the other spectacular features on the car. Beautiful shining pearl paint finish on the just completed Golden Sahara II. Close up of the pearl paint finish. People who saw The Golden Sahara at it first outings around 1958 mentioned the paint looked like something they had never before seen in their life “Just out of this world”. Shortly after the Golden Sahara was painted disaster struck. 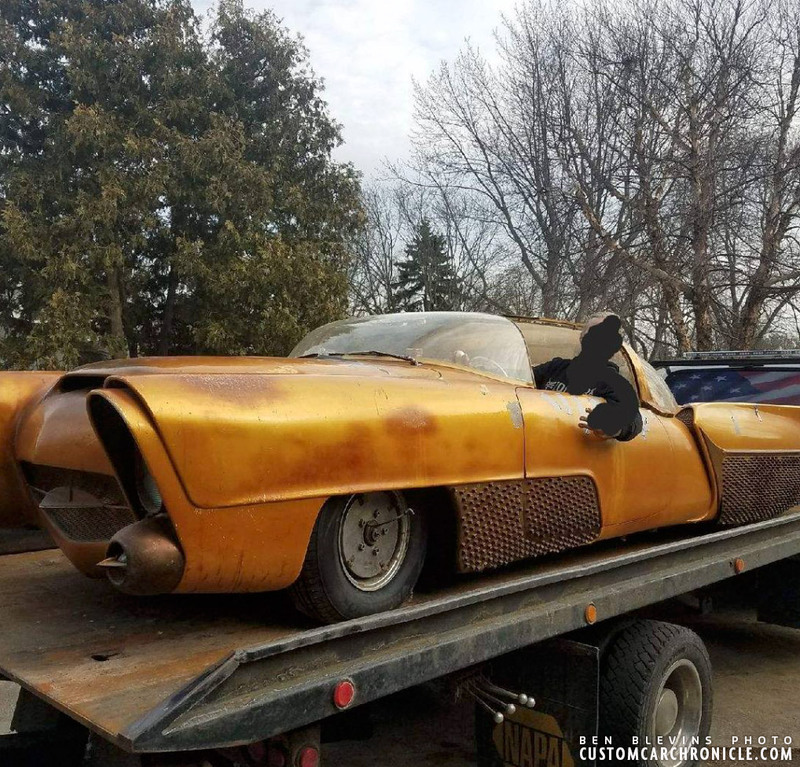 The car was painted perfectly and sitting in a corner of the Delphos Machine & Tool shop to dry and parts of the car were in other parts of the shop. There was this guy working at the shop one evening and apparently he was drunk at the time. He had just finished painted a car green. He was walking around a bit with the paint gun still in his hands and trips over something on the floor. While falling down he pushes the handle on the paint gun…. green paint every-were! Part of it went over the fresh Golden Sahara II paint and and on the just finished hand made plexiglass windows. Fortunately the paint was covered with a few coats of clear, so that could be sanded down and re-polished, but the plexiglass windows were a lot harder to clean… more on that in another Golden Sahara Story. The soft glowing shine of the pearl paint combined with the gold plated body accents looked spectacular. 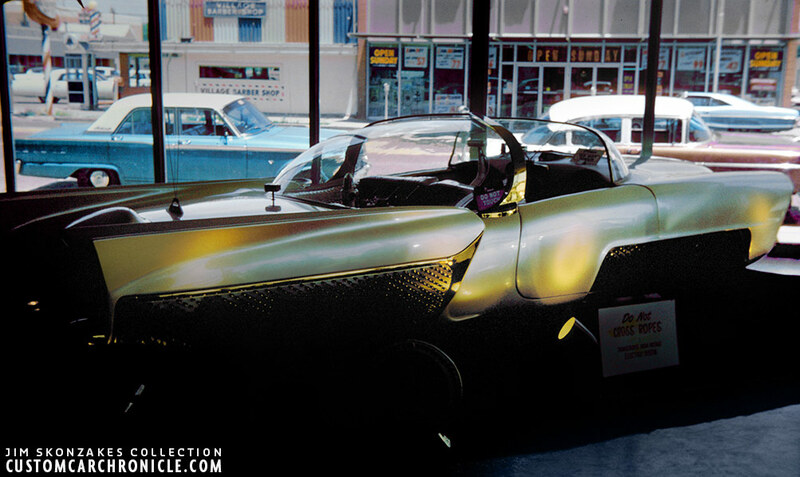 The Golden Sahara I Pearl Paint at Larry Watson’s Artesia Blvd Shop photographed in the late afternoon around 1960. 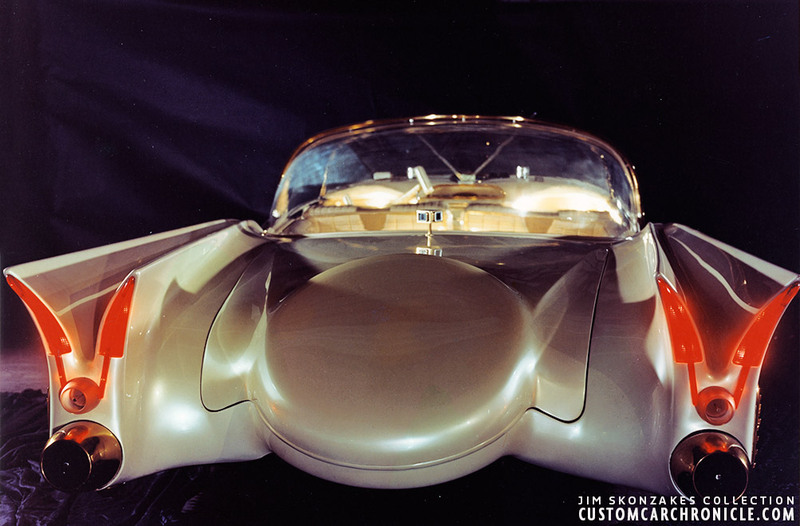 Due to the fact that Nitro Cellulose clear paint was very sensitive to light, and would yellow and even brown over time, the first pearl paint job on the Golden Sahara did not last too long. After the clear had yellowed it had lost its wonderful sparkle and looked a bit dirty. More experimenting was needed and different products were used. Champion Bronze Powder & Paint Company as well as the Mearl Corporation were asked to help solve the problem. For the new paint job the Pearl Paste and powders were mixed in with a different base. The new paint job was done by a friend of Jim, Russ George, at a local Ford Dealer paint booth. 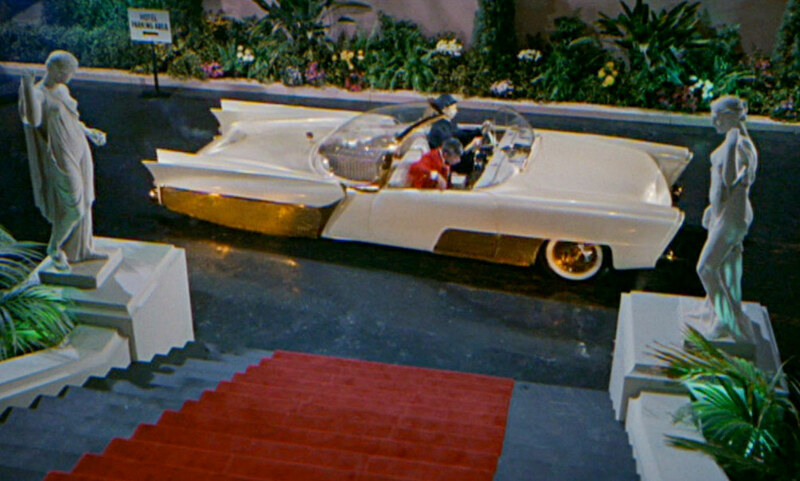 The car was painted a few times more during its almost ten years on the show scene. As far as we know the car was last painted pearl white around 1964 by Russ George. This same paint job although very much yellowed and deteriorated is still on the car when it was uncovered in 2018. My Dad, Russ George, was best friends with Jim Street all through the years until he past away in 1982. I can remember first meeting Jim when I was around 12 in the late 1950’s and since have looked up to and admired Jim for his talent and imagination, way ahead of his time and just being one of the good guys. My dad was involved with the construction and painting of the Golden Sahara and Jim always said Dad was one the the best he had ever known. He wasn’t the only one involved, a lot of talented guys from Dayton Ohio were also involved, the talent was amazing. Dad also traveled with Jim around the country for many years. If Jim had to get back to Dayton, Dad would go ahead and demonstrate the car and electronics, load up and meet Jim at the next show. My dad painted the Sahara in 1962-1964 time period. He could have used acrylic lacquer clear like what was used on the repainted Kookies Kar, but he rather used straight lacquer clear. Because as the paint aged it got a slight yellow tint and looked so much better than the new pearl with water clear. As you can see after 50 years the clear turned yellow/brown. My dad did lot of work on the car through years and of course painted it the last time. I’ve been around the car since Jim brought it back to Dayton right after it was built. 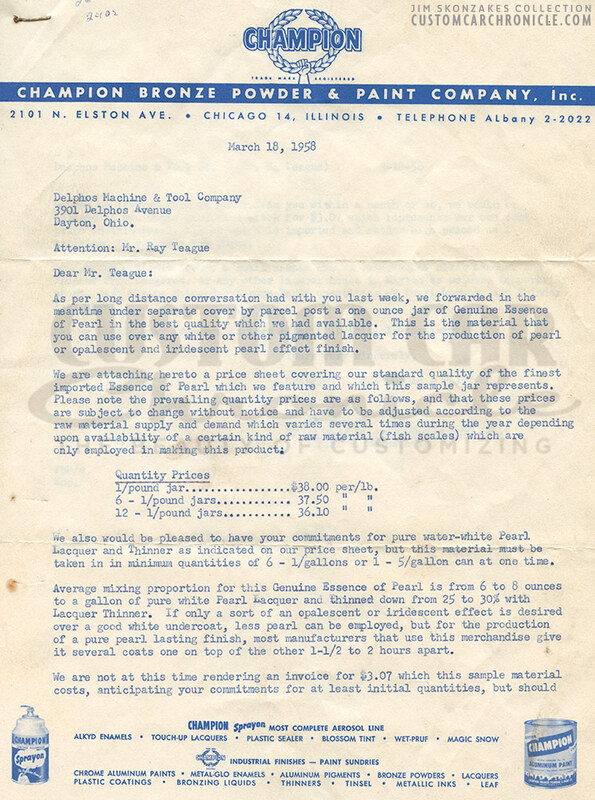 Correspondence between Jim Skonzakes, The Delphos Machine & Tool Company and Champion Bronze Powder & Paint Company about Pearl Paste and how to solve the problems that happened to the first paint job. 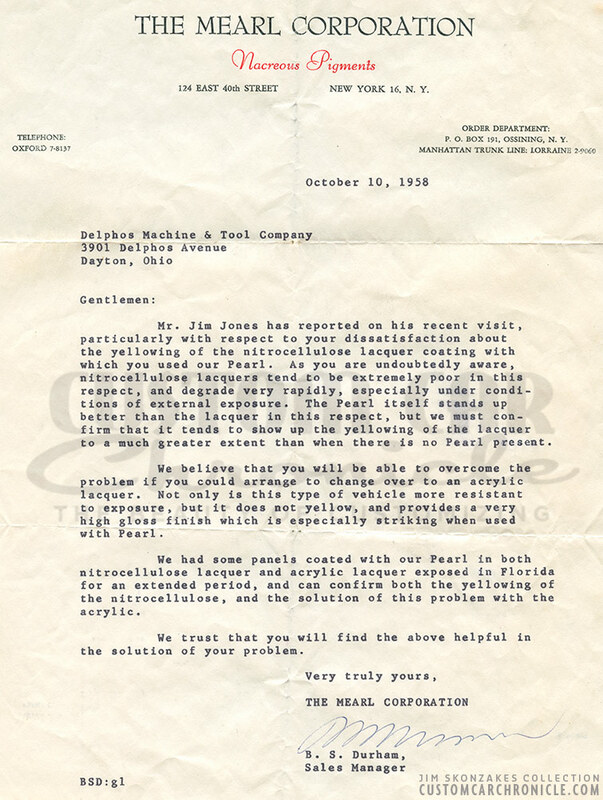 Correspondence with the Mearl Corporation in October 1958. Even in black and white photos you could see how special the glow of the pearl paint was. The pearl paint looked very sparkly in the Jerry Lewis Cinderfella movie. Golden Sahara Pearl paint shining in one of the dealer show rooms it was displayed in all over the US. 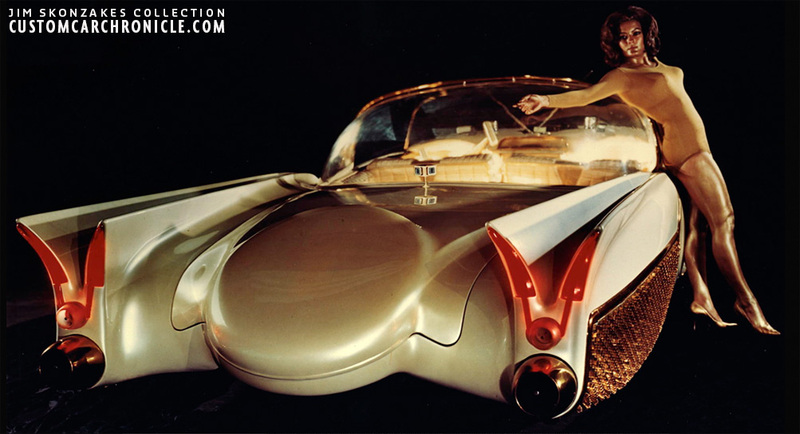 The combination of the special features, unique futuristic design and out of this world Pearl Finish made the car a huge crowd magnet. The Sahara II has never been any other color but white pearl in its lifetime. After Bob Metz completed all the metalwork it was painted here in Dayton by Bud West. The last time painted was also here in Dayton at Russ George’s body shop. I was only about 24 and did some prep and prime work along with his sons, plus Tom Schnebly, Jim Begley, Street of course, and several other volunteers. It was done in lacquer. It’s present condition (2018) is result of complete neglect while stored in his business warehouse and garage. There was never gold paint on this car. That’s what lacquer does with age and why it was reformulated to acrylic lacquer a few years later. 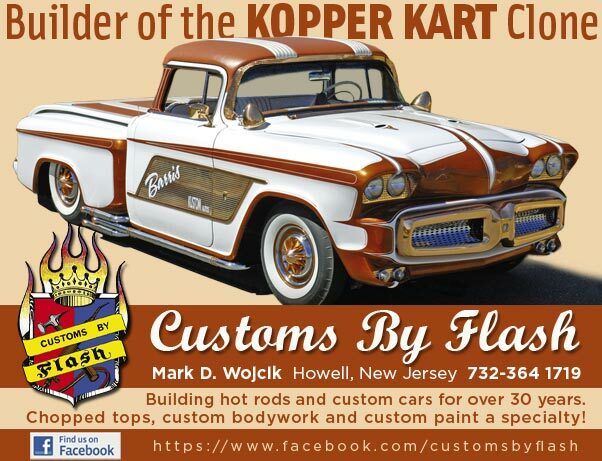 Note: The Kookie roadster was painted with acrylic white pearl the second time around 1964, and did not turn color. 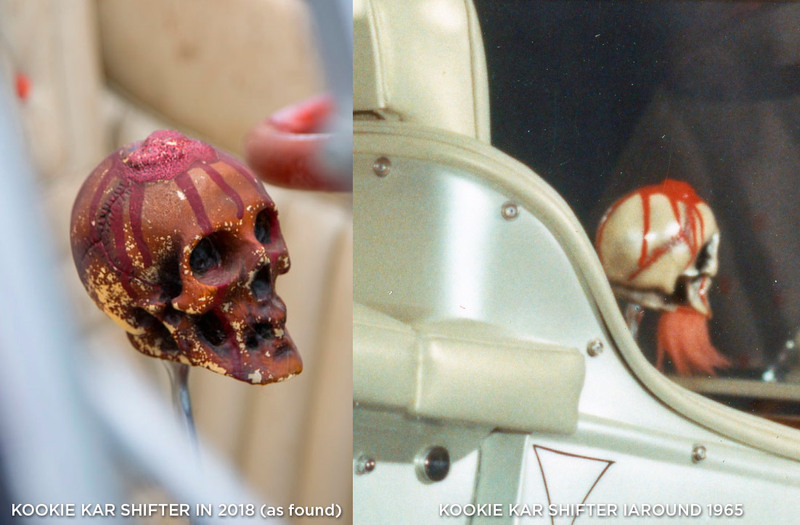 Note: Perfect example the shifter skull, unlike the body, and the skull above the rear end on the Kookie roadster I did in nitrocellulose lacquer base and clear, and it too suffered the same consequence over the same period of time. The turned yellow/brown clear on the Kookie Kar shifter knob with the original nitrocellulose lacquer around 1965. The same as we see on the Golden Sahara. A young Don Boeke on tour with the Golden Sahara in 1965. The Golden Sahara moved over to the Radar Security building in 2018. This is the building where Jim Street used some of the special electronics developed for the Golden Sahara to start his Security business. Outside at last…. We all have been waiting for this moment many years! The Golden Sahara, and other parts from Jim Streets Collection will be auctioned in May. This will be very interesting. 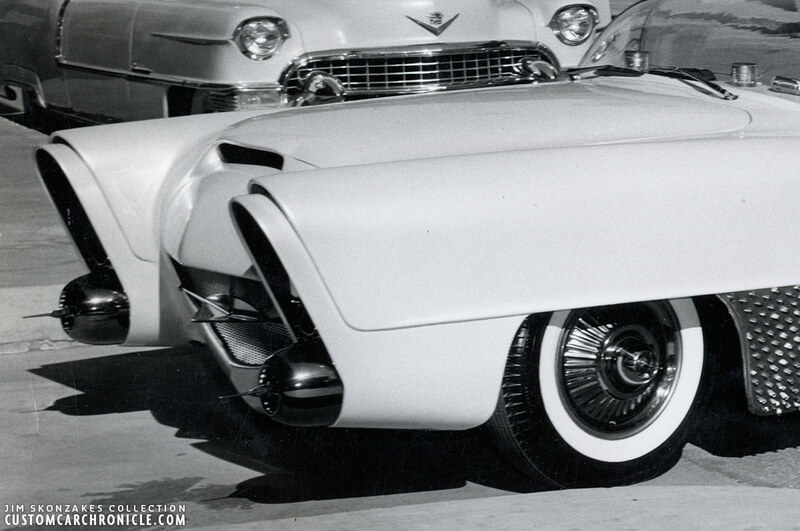 When Jim Skonzakes experimented with the Pearl Paint to be used on a car in 1957 he was not the first to do so. In the early 1930’s several car manufacturers had already offered their cars in a pear-essence paint. In 1932 Chevrolet listed a few colors in their paint options that were pearl based paint. Of special note is that these pearl colors were only optional for the upper body parts, and a special not on the paint chart was made that these colors were impractical to color match. So in case of body damage or paint damage, the whole body needed to be repainted. Therefor this type of paint, which was based on crushed fish scales, did not became very popular, and soon the option was not available anymore. During this time the first more practical metallic paints were developed. 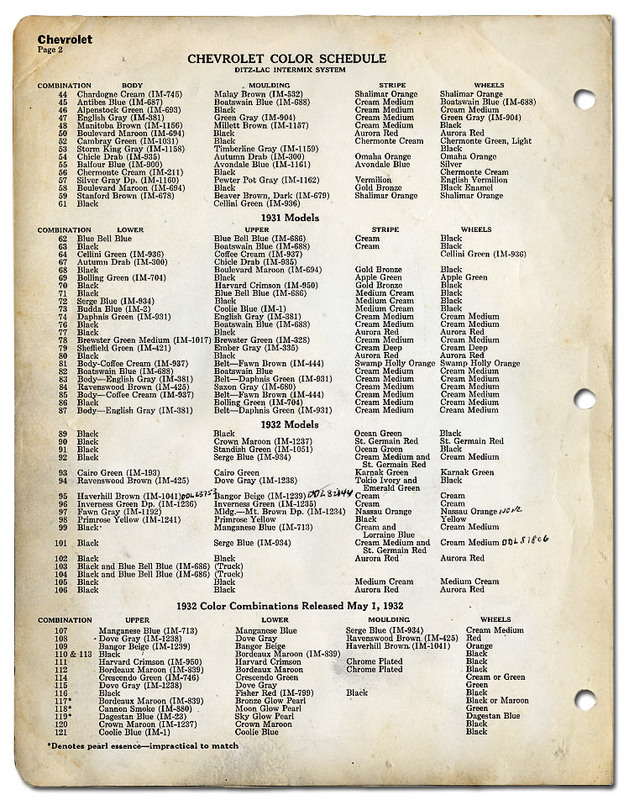 1932 Chevrolet Color Chart listing the Pearl Essence paint. Murano was manufactured by the Mearl Corporation, and was originally used primarily in mass-produced plastics and costume jewelry. There were several color options: white, red, pink, blue, two shades of green, and yellow (often referred to as “gold Murano”). Originally the paste was not marketed as an automotive product, but after Jim Skonzakes had used it on the Golden Sahara and his information how he had created the paint was shared with the Mearl Corporation the Murano Pearl product was marketed in a much wider market. Murano Pearl Paste was compatible with all lacquers, enamels and urethanes due to its resin base. Its color-shifting quality came from fish scales, not pearl or abalone shell as many believed. Murano had a 30% lead content in concentrated form. Today’s lead-free mica-based products offer a nice pearlescent effect, but nothing matches the true pearl quality of a Murano finish. 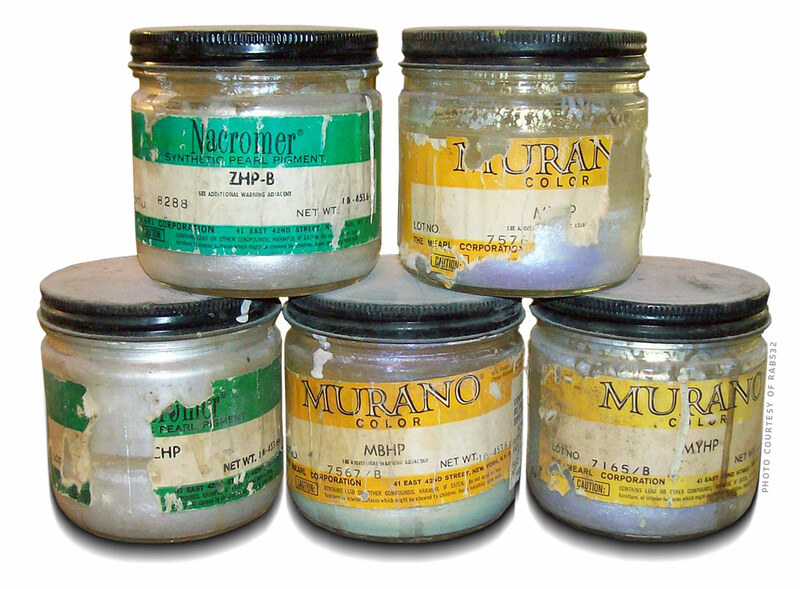 In the late 1970’s lead based paints were banned, and so was Murana Pearls. Newer pearl paints based on powdered mica (like the Mearl Corporation Nacromer series) made painting pearl paints a lot easier, and much more practical and popular, but these never were able to come close to the original pearl shine of the Mearl Corporation Murano Pearls. 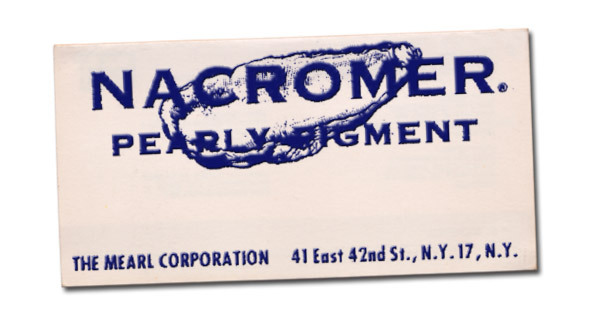 The Mearl Corporation produced Murano and Nacromer Pearl Paste products. 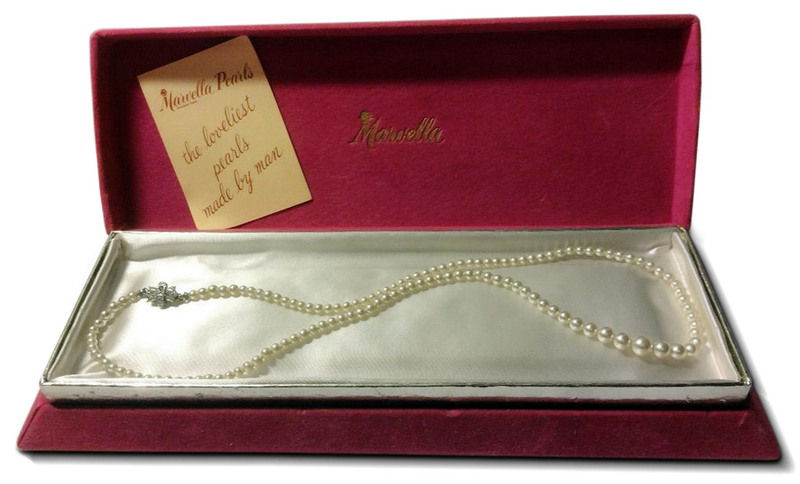 The Murano Pearls were based on fish scales. 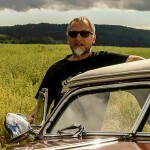 Great article Rik and I am looking forward to more of them. I have been fascinated by this car since first seeing pictures of it as a kid. I hope to one day see it in person. Great article, very interesting reading! Cool article Rik. I am kind of surprised someone hasn’t tried to recreate these original Pearls without the lead. Absolutely incredible! 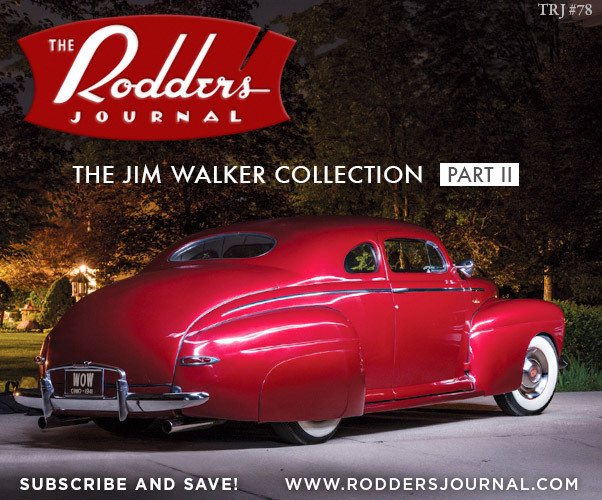 We used to joke about seeing this kustom (and others) within our lifetime…sad to hear of Jim’s passing. The great thing is now we can all enjoy the car and see it out of its hibernation. Hopefully it ends up in the right hands and gets the proper preservation or restoration. Dave Shuten at Galpin would be number one in my opinion. 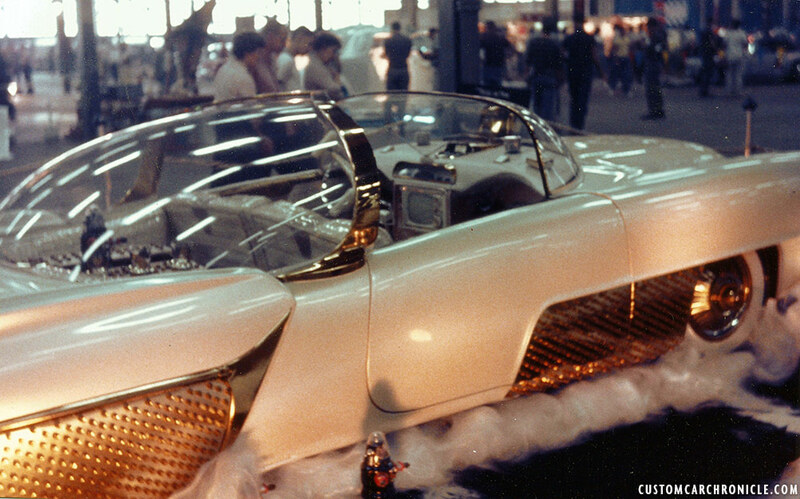 I first laid eyes on the Golden Sahara seeing it in Cinderfella and then around 1965 (I think)..it was on display along with Kookies Bucket T at the local Cadillac Pontiac Dealer here… I was (and still am) awestruck to see it in person. 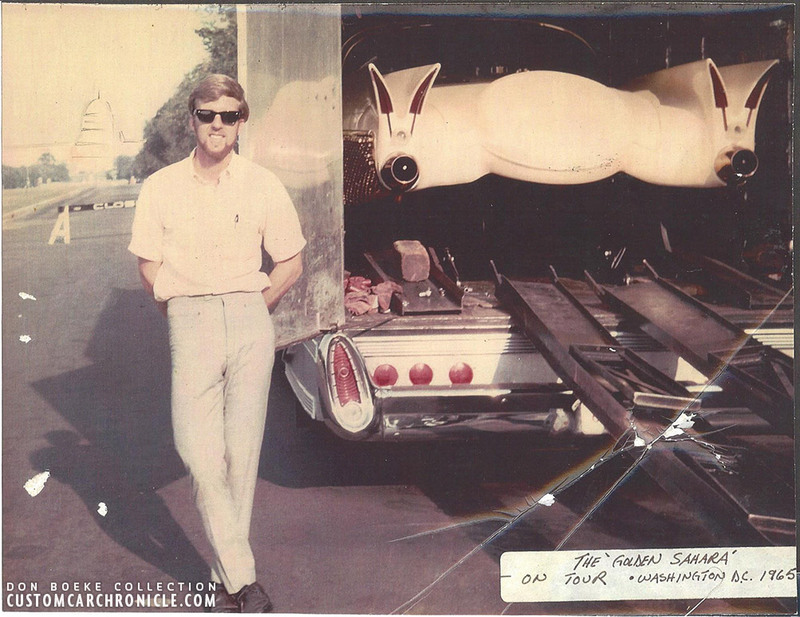 I (obviously among many others) always wanted to know what happened to it…I’m very Glad Mr. Street had and enjoyed the car and preserved it…I look forward to seeing it again in person someday restored to its former Glory….or even as it is..we’ve all aged a bit since then….Still amazing….